The Trades Union Congress has warned Theresa May it is poised to throw its "full weight" behind calls for a referendum on the final Brexit deal. 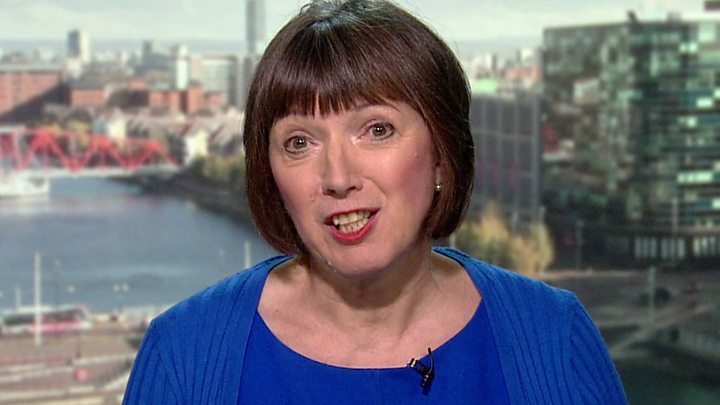 TUC leader Frances O'Grady said that unless the government struck "the deal that working people need" with the EU, she would demand a "popular vote". "It's only right that people should get a say," she told the BBC. A referendum like this is the demand of the People's Vote campaign, which has backing of some MPs from the two largest parties. Speaking on the BBC's Andrew Marr Show as the TUC conference gets under way in Manchester, Ms O'Grady urged the government to extend the UK's EU membership to allow longer for negotiations. "Time is running out and a crash out of the EU would be an absolute disaster for the people we represent," she said. She said people's livelihoods at companies like BMW, Airbus and Jaguar were at stake, calling for jobs and workers' rights to be the government's priority. "I want to serve notice to the prime minister today that if we don't get the deal that working people need, then the TUC will be throwing our full weight behind a campaign for a popular vote so that people get a say on whether that deal is good enough or not," she said, adding that union leaders always consult their members when they negotiate a deal. Last week the GMB Union announced its support for the People's Vote campaign. To coincide with the start of the TUC conference, People's Vote has published polling suggesting most members of Unison, Unite and GMB supported the campaign's demands. It said the YouGov poll of more than 2,700 trade unionists was evidence of the "growing momentum" for its campaign. But Mick Cash, of the Rail, Maritime and Transport union, said trade unionists had voted to leave "in their droves" because they were "sick of austerity" and "the race to the bottom on jobs and pay". He added: "The talk of a second vote on the withdrawal terms is a de facto second referendum whichever way you try to dress it up and risks becoming a Trojan horse for civil unrest on our streets." Asked whether she backed another EU referendum, CBI director general Carolyn Fairbairn said the focus should instead be on the government's Chequers Plan, outlined in a White Paper last month. "Uncertainty is what is really damaging our businesses at the moment," she told BBC Radio 5 Live's Pienaar's Politics. Ms Fairbairn said a failure to reach any deal would be "a catastrophe" for business. "There are many businesses who don't know if their goods would be legally tradable in a no-deal world. "This is an incredibly serious thing to be considering as a possibility, I think because we are so close to it now, it would be a catastrophe and it really should be taken off the table by both sides."